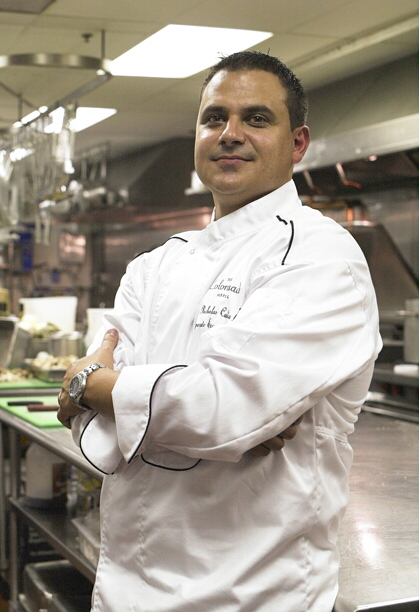 Mastering kitchen skills is tough enough, but Nick Calias, CEC, CCA has taken his career way beyond the kitchen. As Director of Food and Beverage Operations and Corporate Executive Chef at The Colonnade Hotel and Brasserie Jo he is always stirring many pots. And he still makes time to give back. You can meet him in person at Catersource 2019, but we caught up with him just long enough for him to give us a glimpse into his past, his present, his future, and (of course) his kitchen! What was your motivation for becoming a chef? I have always loved to cook. when I was 11 years old my dad bought a restaurant. He asked if I wanted to cook or dish wash? ‘Cook!’ I said (of course). Well, I ended up doing both. That’s where it all started for me, I took over a $10 million F&B operation at The Sheraton Ferncroft when I was 24 and haven’t looked back. You do a lot of teaching and mentoring. What three things does a student need to know about catering? When a restaurant decides to amp up its catering business, how can it best prepare? To amp up a catering business, a company needs to first do its research! See what everyone else is doing, experiment, and give the guest the unexpected. You want to wow the guest. How have consumers’ tastes changed over the years? Consumers palate have grown so much over the years, thanks to the explosion of chefs’ populatrity and the food channels. Guests are more adventurous, and it shows. Things don’t always go right. What near-disaster do you best remember? I had a wedding for 200 people and 90 minutes before the start of the wedding I was walking the room and happen to glance over the menu. Well, the menu said Filet Mignon but my Catering Event Order stated NY Sirloin. Ouch!!!!! So quickly I had to send my sous chefs out to find 200 filets. We then had to change all the sides and make our sauce. We pulled it off in time and the guest had no idea. Moral of the story? ALWAYS review the menu prior to the wedding day. What next in your own career? For me it’s about education and continuing to grow, I am fortunate to have a great food city in Boston where you can explore and try something new all the time. What are you looking forward to most about Catersource 2019? I am looking forward to meeting and talking with so many great professionals in this business, try to pick their brains and see what’s coming up in this field. And YOU can do all those things too. Join us at Catersource 2019! Nancy A. Shenker is Founder/CEO of theONswitch marketing and a professional content strategist, writer, and speaker. She has spent more than 30 years in the events, food, retail, and small business worlds, focused on delivering meaningful and memorable experiences and bottom-line results.